80035 live tutoring sessions served! objects with a 90 degree angle. importance as well as set the stage for its day to day uses. It is always easier to learn a new concept if we can relate to it. Three construction workers are assigned the task to lay out concrete footings for a new building in the main street. The dimensions of the two sides adjacent and opposite to the right angled corner is 25 x 35.7 m respectively. 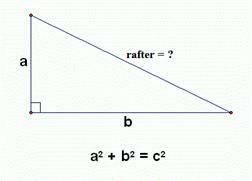 Find the length of the rafter needed to make the roofing. 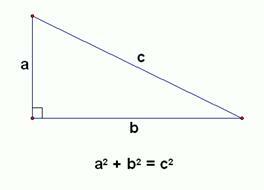 Since a = 25 and b = 35.7, we can use the Pythagorean formula to find the longest side. the house in order to avoid the grass. What is the length of the ladder that Bob needs in order to achieve this task? The square root of 1743.63 is approximately 42, so Bob would need a ladder at 42 feet long. The Johnsons recently moved into their new home with a movie room. Their old TV cubicle fits their old 36 inch TV. However, Mr. Johnson bought a new TV measuring 36 inches x 22 inches. Will their new TV be able to fit into the cubicle? C2 = (362 + (222) = 1780 The square root of 1780 is approximately 42 inches. Therefore, their TV will not fit with their old cubicle. A suitcase measures 38 inches long and 20 inches high. What is the diagonal length of the suitcase in ft? precision skills, they are asked to kick the ball from one corner to the other. What is this distance in ft?